India's central bank, the Reserve Bank of India, kicked up a storm after it asked select "rich" temples of India to declare the value of their gold holdings. Temple boards, which manage temples in India, rejected the RBI's request to furnish gold stock details while Hindu religious outfits threatened to launch a nation-wide protest on behalf of these temples. "We [the Hindu Parliament] had threatened to stage nation-wide protests on behalf of the temples against RBI's stand. The temples are under no obligation to reveal any details to any government body. We have been openly saying that they are touching fire (with this move)," said Rahul Easwar, Secretary, Hindu Parliament, an outfit that has represented Hindu temples at various forums. Speaking to Al Jazeera, Easwar, the grandson of the supreme priest of India's famous Sabarimala temple, said: "The RBI has informed the Travancore Devaswom Board, which manages a thousand plus temples, including the Sabarimala hill shrine, that its earlier letter [seeking details about gold holdings] can be ignored." Who owns the gold lying idle in the vaults of some of India's rich temples? Should India use this treasure trove to tide over its current economic crisis? The US Bullion Depository Fort Knox's website says it has 147.3 million ounces (4,603 tonnes) of gold holdings currently. 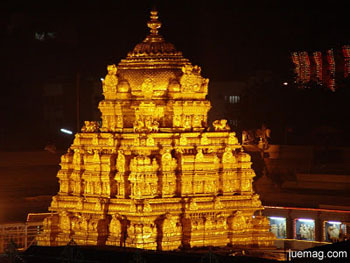 Interestingly, according to the World Gold Council estimates, temples in India have about 2,000 tonnes of gold ($84 bn) and the Reserve Bank of India (RBI, June 2013 statistics) reported holdings of 557.7 tonnes of gold. Lieutenant-Colonel Bhuvanendran Nair (retd), the executive officer of Sree Padmanabhaswamy Temple said, "...all this gold has been given to the temple by the devotees. It is the wealth of the temples. The currency that we get is used to run the temple, pay salaries and pensions of the priests, give food to the poor and other such activities. No one gives us [temples'] money. How else will we function? What will this little gold do to our economy and nation? We have taken a stand to not share any details with the RBI." India, soaking up a third of the world's gold supply every year, is the world's biggest importer of the yellow metal. It imports billions of dollars' worth gold every year and sends its own currency [the rupee, which has lesser purchasing power than the US dollar] overseas. This disrupts the balance of money entering and leaving its economy. Thus, economists explain, the Indian rupee's value has been depreciating. In the current scenario it is good to understand the positive role that gold plays in the global economy. Economic value generated by the industry has a direct impact on the economies where gold production or consumption takes place. Questioning the RBI's move, India's main opposition party feels that the apex body, in consultation with the central government, sought to check the rupee's fall by buying these gold holdings from temples. "I am honest to my God. I go and donate five percent of my profits from every deal to Lord Tirupati. And I pay taxes to the Indian government which is more than 35 percent. Why does the government want the God's share too?" one such businessman, who did not want to be named, said. Houseds of worship such as the Shree Siddhivinayak Ganpati temple of India's financial capital, Mumbai, and the Tirupati temple have already deposited gold into banks and are drawing interest on the same. Bankers and lawyers feel there is no need to worry or create panic. For one thing, it is beyond the jurisdiction of the RBI to dictate terms to the temples. For another since the ownership of the gold lies with temple trust boards, the RBI cannot "use" it. P Chidambadam, India's ex-finance minister, has said at many forums that India aims to better its balance of imports and exports by cutting down the inflow of gold and silver into the country. How it will meet this goal is a question that remains unanswered given the gold obsession, reluctant rich temples, threats by Hindu outfits, sluggish growth and depreciating rupee.